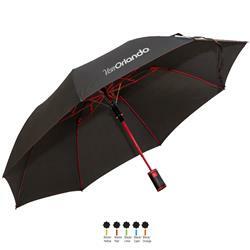 Our Lil Jo 42" Arc Umbrella is on trend and functional with its color coordinated shaft and fiberglass ribs! 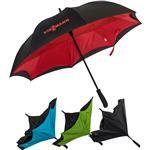 Features include an automatic opening, wind reflex frame and is made of Pongee polyester. Our black rubber spray handle with color accent adds color and visibility! 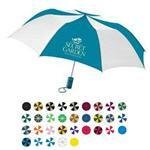 Our Lil Jo Umbrella also comes with a matching color sleeve. 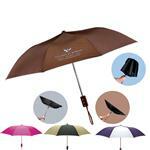 A great modern custom umbrella. Setup Charges: $55 per color/location. Available Imprint Options: Silkscreen. Price includes a one color imprint on one location. Add $1.50 each additional color/location. 4 color process is available and additional. Please Inquire. 18" x 9" x 17"